Home » »Unlabelled » Stop Having Bible Studies. So over the past two years, I have been thinking...and sometimes that is a dangerous thing to do. I'm really trying to flesh this thing out. It's been something that I've seen in my own life and I'm struggling with it. So hang with me as I talk this out. I know so many men and women who are a part of multiple Bible studies. They go to studies on Sunday mornings, Wednesday nights, and some even go to another midweek study. Women's Bible studies, Men's Bible studies, couples Bible studies...the list goes on and on. There honestly is no shortage of Bible studies we can attend. The thing that truly just blows my mind is that you'd think that with all of those Bible studies that we all are involved in and all of those hours we've spent together pouring over and talking about the Scriptures we'd truly begin to see some type of really big change in our communities because of it, right? Well, why then are we really not seeing anything different? Let me explain further. A majority of people who attend church are just as angry and bitter as lost folks. We have husbands and wives that really are not loving each other like Christ loves the church. We have children that are so disrespectful to any type of authority that it's just sickening. But all the while we have so many of these people 'plugged into' a Bible study of some type. So what is the problem? If you know that you as a husband should be loving your wife as Christ loves the church and you're not you are actively living in sin. If you know that loving your enemy is a mandate that was handed down from Jesus Himself and you do not then guess what? You guessed it. You're living in sin. You see what is happening is that we are living in a replacement mentality. We are actually replacing DOING what God has called us to do for just reading and studying about it and thinking that is good enough. We spend tons of time sitting in group Bible studies talking about how we should live as Christ followers. What would happen if we started to have Bible DOINGS and actually living out the mandates of Christ? What would it look like if we, instead of doing another Bible study over 'NOT BEING ASHAMED TO SHARE THE GOSPEL' actually went out to the local public square and actually share the Gospel? Engaged people and talked to them one on one. What would it look like instead of having another couple's Bible study that you planned a couple'ss MISSION trip in your city of state to go and actually do something together as a couple? You see if you're both as a couple focused on a COMMON MISSION you don't have time to fight. If you're both LIVING THE GOSPEL OUT TOGETHER, you won't argue you'll find ways to help and encourage one another. Now, don't get me wrong...I'm NOT saying to NOT read or study your Bible because you should! But what I am saying is that if you're studying the Bible and you're NOT DOING what you are studying then there is a problem! I'm saying that if you do the study it should not just get a head nod, an amen and that's it. Studying the Bible should push us to action, not just agreement! If we AGREE with what we are studying then it should result in action. Stop just agreeing and start doing! Move in a direction and get out of your comfort zone! 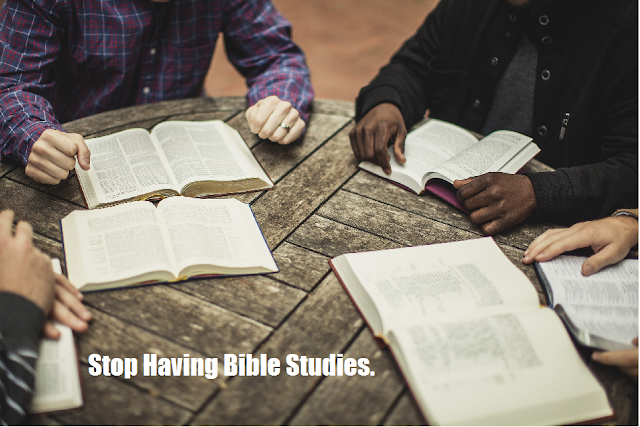 Stop just HAVING BIBLE STUDY and start BIBLE DOING!